sunglasses (a sponsor) – amber lenses for hazier light. in our navigation charts. . Kadavu isles, Astrolabe Reef, Fiji. Most cruisers visiting Fiji skip Astrolabe Reef’s Kadavu isles. Indeed, navigating their treacherous coral-strewn shallows, using inadequate and sometimes shockingly inaccurate marine charts is not for the faint of heart. light there are many dangers. After a stressful trip navigating into Kadavu’s Naisogonkino’s Bay, we were rewarded with glassy calm water and a peachy sunrise the next morn. Kadavu isles, Astrolabe Reef, Fiji. 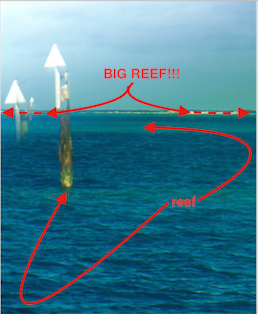 This is especially true in Astrolabe Reef, based on our brief experience. 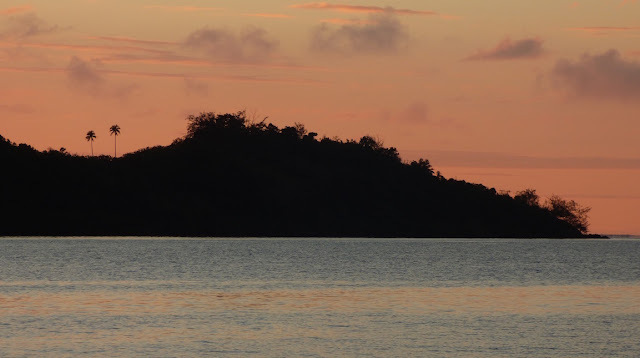 Nonetheless, we bid the Kadavu isles goodbye with our hull still intact and as much reluctance as relief. Naisogonkino village women, often in the sulus, like those we observed in Ono, netfished chest-deep along the shoreline for hours. Men, on the other hand, donned sunglasses, t-shirts and shorts, and left in skiffs with big motors to fish offshore. 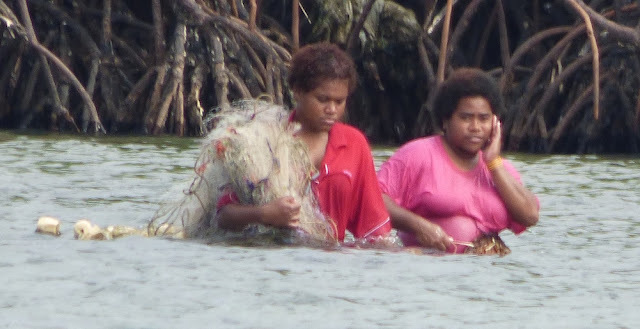 Fishing done at last, the village women gather their nets and wade back to Naisogonkino village, Kadavu, Fiji. Is the woman on the right on her mobile phone? Not sure, but quite possibly; villages remote but connected. 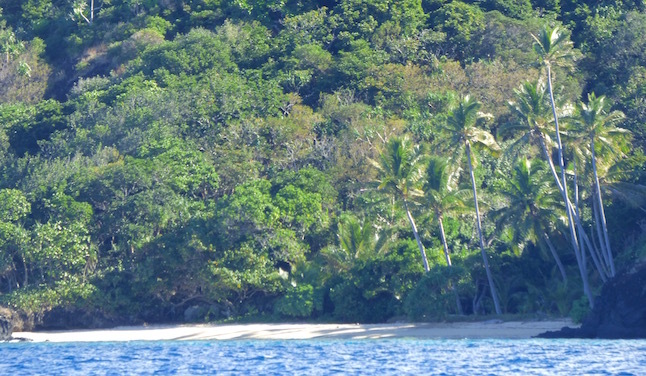 While we did not arrive early in the Fiji cruising season, in the Kadavus we were the first or second yacht of the year in four out of the five* anchorages where we stayed. Except for cruise-ship dazed Dravuni, we were heartily welcomed in every village (and Dravuni wasn’t unfriendly, just a bit too busy to kowtow to two cruisers when they’re recovering from hosting a couple thousand passengers a pop). *in one anchorage we were the third yacht of the year, Bidule beat us out on Ono by a few days. 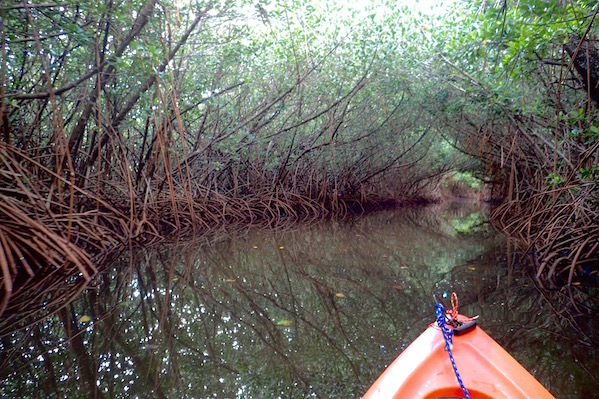 Naisogonkino Bay mangrove offers a dinghy-able pass through to the adjacent bay during the three hour period surrounding high tide. Here, I make the pass via kayak, after failing earlier due to low tide. Kadavu isles, Fiji. Bay adjacent Naisogonkino on the other side of the mangroves, home of a huge flock or large fruit bats. Notice the near-full moon above the ferrous red rock column? Kadavu, Fiji. In fact, Kadavu villagers were so unfailingly friendly, in the final village we anchored near, Naisogonkino, we opted out of our sevusevu, gratefully riding the coat-tails of Tangatatu’s sevusevu on both boat’s behalf. Chris and Meaghan (of Tangatatu) chose Naisogonkino because its location was so close – in reasonable dinghy range -- to the edge of Astrolabe reef. Dusk casts its golden glow across Naisogonkino Bay’s hills, palms and mangroves. Kadavu, Fiji. There, with some local-knowledge-armed nudging from Chris and Meaghan we zipped through the mangrove, passable only at high tide, into the adjacent bay, then beyond. 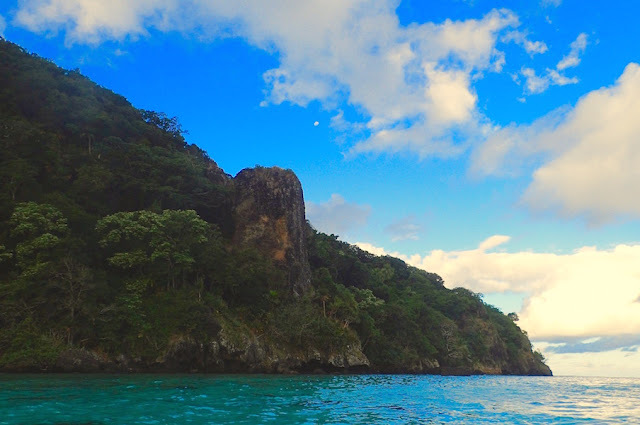 We snorkeled in the “Oh WOW!” clear waters just inside the embrace of Astrolabe’s outer reef. There was a diverse, healthy range of coral, a nice variety of small fish and some nasty reef-munching crown-of-thorn starfish as well as a nice collection of Christmas tree coral worms, though not as prolific as at Minerva Reef. We didn’t see any sharks. The shy puffer fish Meaghan spotted was the coolest reef dweller we saw that day. While I bet local guides know the coolest spots in Astrolabe, the variety if not the clarity was better off Ono’s pass outside Nabuwalu Bay. Still, I wish the charging cable for my water camera hadn’t gone into hiding. Definitely photo-worthy! Motivated me to find it the next day and finally recharge my camera, but didn’t snorkel again before leaving Astrolabe. Just means more snorkeling, camera in tow, in the future! Oddly, the shadows drafing Naisogonkino Bay’s rolling hills remind me of drives home from vacation, entering California’s Silicon Valley from the North East. Kadavu, Fiji. Reefs may make for some scary navigation, but they sure make for some awesome snorkeling and diving! That is part of the reason we’re in Fiji, so more to come! Even if you never snorkel or dive, the Kadavus are worth a detour if for no other reason than to meet the villagers. We never did spend the afternoon as intended at this Shangri-La-like beach off Kadavu’s Naisogonkino’s Bay. 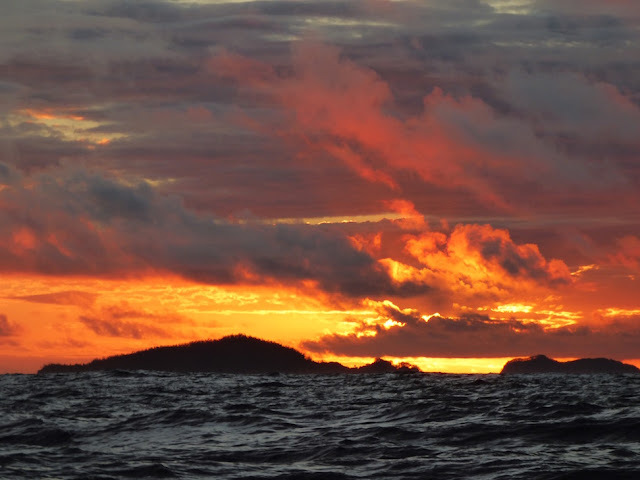 June 15, 2016 we arrived and June 16 left Naisogonkino, our last Kandavu isles stop, Fiji (S19.00.083 E178.28.205). We are currently in Savusavu, Vanua Levu, Fiji (S16.46.706 E179.19.785). For those paying close attention, yes, this post is out of sequence. Levuka, the last post, occurred after Kadavus. After Levuka and before Savusavu, we stopped at Makongai. More on Makongai in a future post. Sailing away from Astrolabe Reef, mist from the crashing surf across the coral reefs softens the view of the island silhouettes inside. December 2014 to November 2015 we sailed over 10,000 miles from Florida to New Zealand. where spent cyclone season. In May, we sailed 1,000+ miles to Fiji. Next we’re off to Vanuatu, New Caledonia finishing in Australia, 4,500+ miles later. There, around November, we’ll sell our boat, travel a bit, then go back to work …somewhere. Fieriest sunset we’ve seen in Fiji. If I didn’t see it myself, I’d swear it was someone else’s image made more vivid by drugs. Kadavu, Fiji. FIJI: Caves at Sawa-i-Lau, Yasawas?! ?